The best writers say their work seems to come from a source beyond the thinking mind. But how do we access that source? "We must first look inside ourselves and be willing to touch that raw emotional core at the heart of a deeper creativity," writes Albert Flynn DeSilver. In Writing as a Path to Awakening, this renowned poet, writer, and teacher shows you how to use meditation to cultivate true depth in your own writing--so your words reveal layers of profound insight that inspire and move your readers. 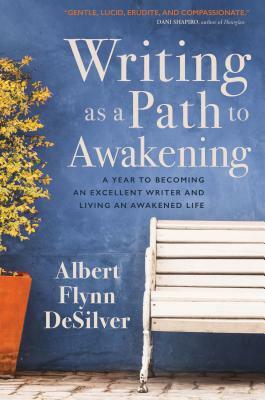 "Writing and meditation practice are a powerful pair, a dynamic duo," Albert Flynn DeSilver teaches. "Together they nourish and push, trigger and define, inform and inspire, enable, and energize. To engage in both practices fully is to activate a more complete, creative, and spiritual self." With a mixture of engaging storytelling and practical exercises, Writing as a Path to Awakening invites you on a yearlong journey of growth and discovery--to enhance your writing through the practice of meditation while using the creative process to accelerate your spiritual evolution. Albert Flynn DeSilverALBERT FLYNN DESILVER is an internationally published poet, memoirist, novelist, speaker, and workshop leader. He has published several books of poetry and Beamish Boy (Owl Press, 2012), which Kirkus Reviews calls, "A beautifully written memoir of awakening and self-acceptance." He teaches at the Omega Institute, Esalen, Spirit Rock, and writing conferences nationally. He lives in northern California. For more, visit albertflynndesilver.com.